Your information will not be sold exchanged transferred or given to any other company or person for any reason whatsoever. If at any time you wish to unsubscribe, please send an email to Pipeworks@vtpipes.com with the word 'unsubscribe in the subject line. 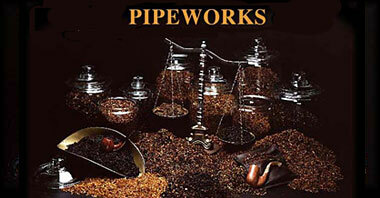 Briar Workshop dba Pipeworks requires enthusiasts to be of legal age (18 years old or in some areas 21 years old) to purchase tobacco products. Briar Workshop dba Pipeworks does not sell cigarettes nor roll your own tobacco . Briar Workshop dba Pipeworks is not responsible for errors, typos or omissions and prices may change without notice. Vermont sales and tobacco taxes will be added to items shipped into Vermont. You are 18 years (21 years in some areas) of age or older. You agree to use our products for their intended purposes only. You waive without exception your right to hold Briar Workshop liable in any way for the misuse of our products. Our customers agree that smoking is potentially dangerous to one's health, thus we do not take any liability to our customers' health status.